Rose Quartz is such a pretty stone. If I wore pink, I'd make so much from this delicate pink crystal. You may remember a couple of years ago I came second in a Designer Quest. That pack included three lovely double drilled rose quartz pieces. You can see a picture of it here. 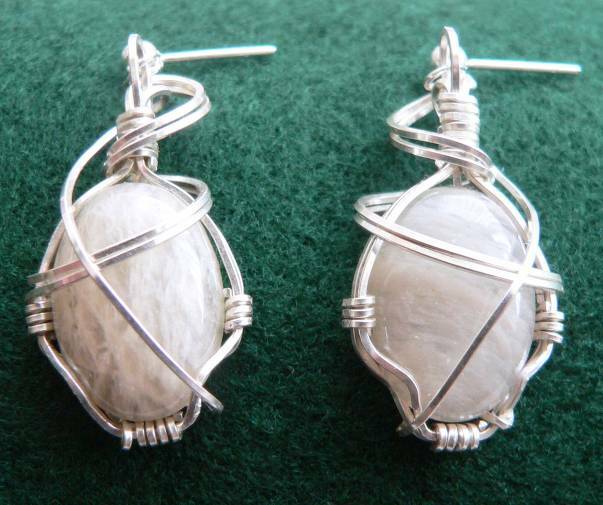 One of the favourite pairs of earrings I have made are also rose quartz. I wire wrapped them with sterling silver wire. Annette Piper is an Aussie beader I was lucky enough to meet at a Bead and Gem show a few years ago. Annette has a background in gemology and gives a wonderful description of rose quartz on her blog 'Under the Loupe'. I encourage you do read it and see her beautiful rose quartz bracelet. Love those earrings Mezz - they look fiddly - I don't have that much patience, I'm sure! Thanks for the mention!! !